FUE vs. FUT: Which Transplant Procedure is Right For You? With incredible advancements in today's hair transplant technology, patients now have various options for treating thinning and balding. At True & Dorin Medical Group, Drs. Robert H. True and Robert J. Dorin offer both FUE (follicular unit extraction) and FUT (follicular unit transplantation) to help patients successfully achieve their goals. While both options can produce long-lasting, natural-looking results, each type has distinct advantages. You should carefully weigh FUE vs. FUT based on your individual needs, budget, and lifestyle. The main difference between FUT and FUE is the way that the hair follicles are harvested from the scalp. FUT: During FUT, a narrow strip of skin is excised and the edges of the incision are sutured together. Individual follicular grafts are then extracted from the strip and then transplanted into tiny incisions in the balding areas. FUE: In order to perform FUE, the doctor isolates and removes individual follicle units from the donor site. A very small punch tool is used to remove superficial layers of skin around each unit for precise extraction. These units are then transplanted directly into the treatment area. A patient’s treatment decision depends on their candidacy, individual preferences, and ultimately, what the doctor recommends as being the best approach. During a full consultation, Dr. True or Dr. Dorin will discuss your goals, fully examine the extent of your hair loss, and discuss the pros and cons of each procedure. FUT is an excellent choice for patients who like to keep their hair longer and are interested in more cost-effective treatment. FUE is a more specialized, laborious technique that relies on incredible precision to extract and then place each individual hair follicle. Patients with shorter hair are good candidates for this procedure, as it does not require stitching and does not leave noticeable scarring. Dr. True and Dr. Dorin have spent decades performing both FUE and FUT on thousands of patients suffering from all types of hair loss. Whether you are interested in a more youthful, refined hairline or an overall thicker head of hair, the doctors will walk you through your options and help you achieve your goals. 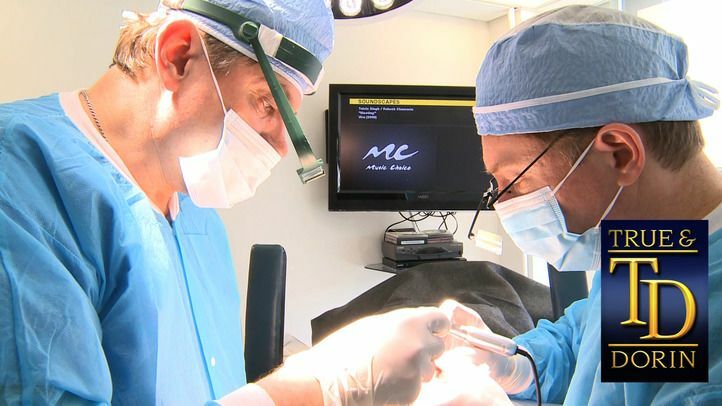 For more information regarding our various surgical techniques, please send us a message or give us a call at (866) 629-0866 to set up a consultation.